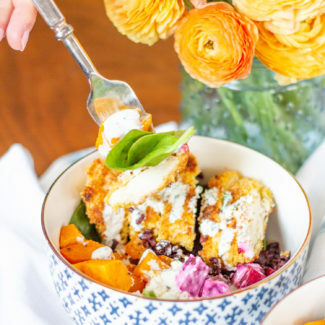 This Roasted Acorn Squash and Spinach Salad combines fresh spinach, roasted acorn squash, dried cranberries, goat cheese, and crumbled goat cheese for a delightful meal. 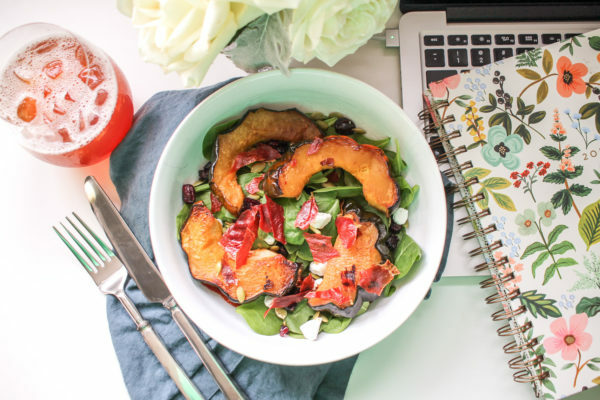 This Roasted Acorn Squash and Spinach Salad is both exceptionally delicious and hearty enough to be a complete meal. 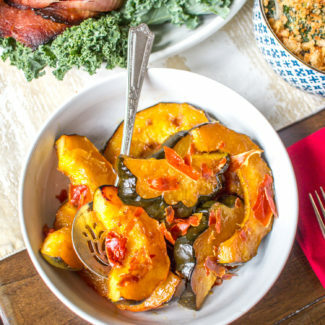 When I made roasted acorn squash as part of my holiday menu, I had plenty leftover. 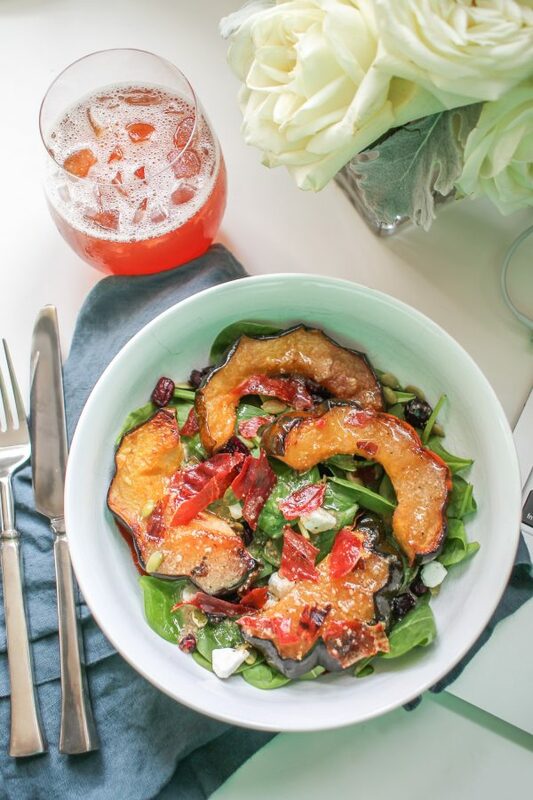 The leftover roasted squash became the inspiration for this Roasted Acorn Squash and Spinach Salad. Since the squash was already roasted, this salad came together very quickly. I just reheated the squash in the oven, and at the same time, I crisped up some prosciutto. 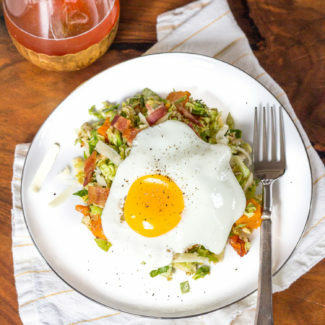 Once the squash was hot and the prosciutto had hardened, it was time to assemble the salad. I added the squash, along with some goat cheese, craisins, and pepitas on top of baby spinach. Then I crumbled the prosciutto on top and drizzled some parmesan and roasted garlic vinaigrette on top. The tanginess of the goat cheese and the saltiness of the prosciutto are the perfect compliment to the mellow sweetness of the squash. 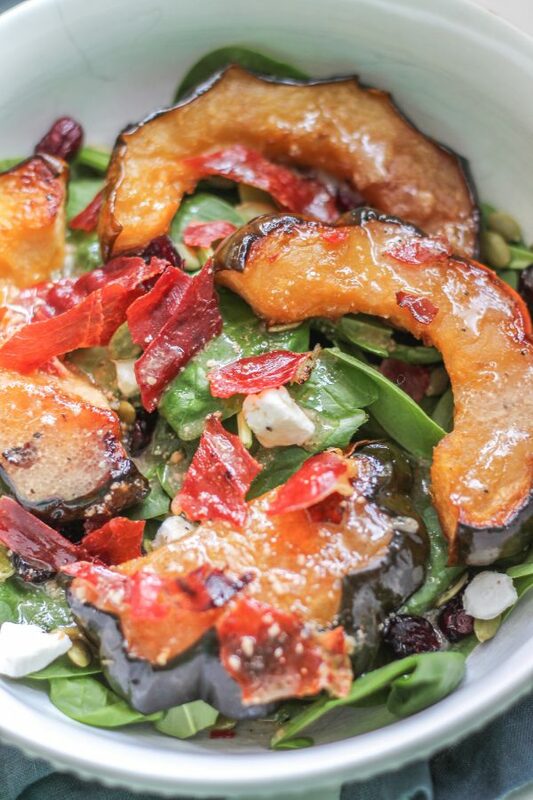 The craisins give the salad a burst of fruity freshness. I used a parmesan and roasted garlic vinaigrette made by Newman’s Own. I am a huge fan of roasted garlic dressings because they add a rich flavor to a salad. Stonewall Kitchen also makes an incredible Roasted Garlic dressing. You might be curious about why I left the skin on the squash. You can eat the skin of the squash, or you can easily peel it off the squash once it has been roasted. Peeling squash before roasting it can be a challenging task, I prefer to slice the skin off after the squash has been cooked. 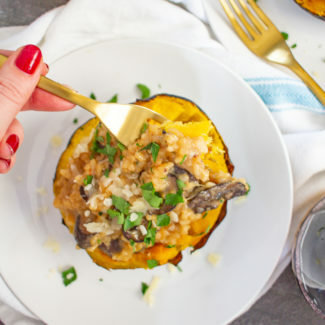 If you happen to have roasted butternut squash instead of acorn squash, you could absolutely use it instead. 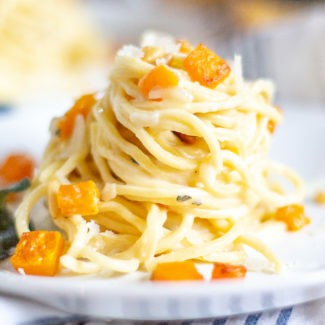 I do think that butternut squash is a touch sweeter, but it will still work in this recipe. 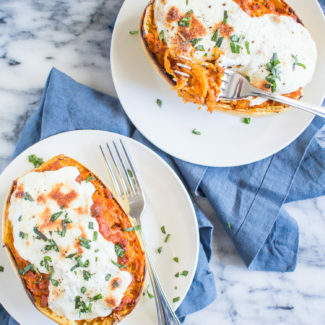 A plus to using butternut squash is that you can often find peeled and diced butternut squash for sale at the grocery store. Heat your oven to 350 degrees. Line a baking sheet with parchment and arrange the squash and prosciutto on top, being careful to space it out. While the squash and prosciutto are in the oven, divide the spinach, goat cheese, craisins, and pepitas between two bowls. After about 12 minutes the prosciutto will have hardened and the squash will be hot. Add the squash on top of the salads, and crumble the prosciutto over. Drizzle the roasted garlic dressing over the top.